The Big Apple is considered to be the best city on earth. Just visiting Manhattan will provide you with enough things to fill a 3-day trip to NYC. Ofcourse, NYC offers many attractions and things to do and this is where we com in. We have created for you an hour-by-hour “Best of New York City in 3 Days’ itinerary”, which has all the top things to do and see in NYC in 3 days. By getting this travel itinerary you will save time, save yourself from the stress on organizing your trip and save money thanks to our hard-to-find tips. 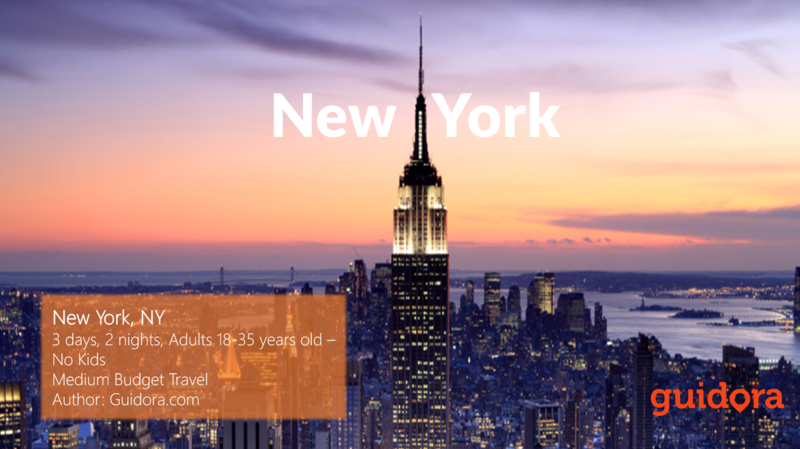 – Which hotel to stay in, in New York, so that you are close to all attractions, without breaking the bank. – What exactly to see starting out every day from your hotel, with detailed maps and costs of every activity. – New York is a shopping paradise. You will get inside info on where to find the best shopping deals for clothes, shoes etc. This is guide, is exactly like having your best friend in New York, showing you around for 3 days. It will help you spend the best 3 days you could possibly have in New York. Sounds good? Get it now! You can also get a sample of what’s included in the guide by clicking below.